The city of present-day Zafarabad finds its origins in the ancient times but offers a chequered history as over time the city changed its character at the hands of many rulers who ruled over it. However, as it never was a city of much strategic or political importance, Zafarabad’s name remained low-profile and it was only of any importance to the immediate local region. Zafarabad is situated on the banks of the Gomti River, to the west of Allahabad. Zafarabad in the ancient days was a part of the proud kingdom of Kosala and was ruled over by the Suryavanshi (Solar dynasty) kings of Ayodhya. At that time the city was called Manaichgarh, a name that it carried until it was taken over by the Muslim rulers who changed the name and character of the city. In the ancient times and early Vedic period of history, Manaichgarh was a centre of culture and religion of the Hindus and the Buddhists as established by the ruins of temples and stupas found in abundance in the region. The region flourished under the reign of King Harsha during the 7th century when it came under his empire. After the later Guptas when entire north and central India was thrown into political chaos, for a brief period, the region was annexed by the Pala kings of Bengal. But they were soon overthrown by the Pratiharas and Bhojas who exercised their control over the region. The last Hindu king of Manaichgarh was Jayachandra of Kannauj, who is also credited to have built a strong fort here, enclosing eight acres of space to the west of the city. The ruins of Jayachandra’s fort can still be seen in present day Zafarabad. After King Jayachandra’s defeat and death at the hands of Muhammad Ghori in 1194, the entire region passed under the clamp and rule of his Turkic generals, who completely ransacked the area and razed all religious monuments and buildings, bringing in chaos, destruction and anarchy. From the time of Muhammad Ghori’s conquest till the reign of Sultan Firoz Shah Tughlaq in the Delhi Sultanate, the region came completely under the influence of Islam and gradually began to change its character. 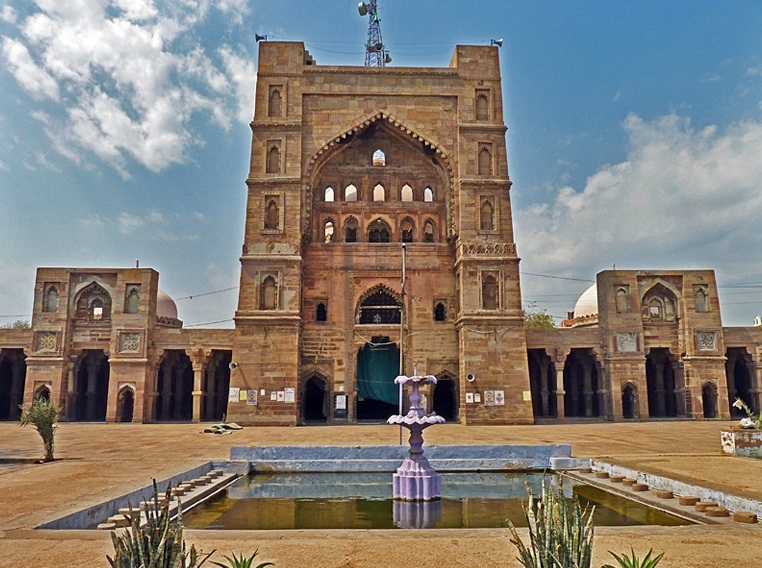 It served as an important stop on the route between Delhi and Lakhnauti (Lucknow) and started to grow in importance. In 1321, Zafar Shah was appointed as the governor of the region and he made considerable improvements to the city. It is after him that the city came to be called as ‘Zafarabad’. The advent of the famous Muslim Sufis, Makhdum Sadr-u’d-din (titled Aftab-i-Hind) and Makhdum Asad-u’d-din (titled Chirag-i-Hind) made Zafarabad an important seat of Islamic learning and culture. Zafar Shah himself gave the city the name ‘Shahr-i-Anwar’ (city of holy lights), but the appellation could not substitute its popular name Zafarabad and the city continued to be known so. In 1394, the Delhi, Sultan Nasiruddin Muhammad Shah (IV) Tughlaq, appointed Malik Sarwar as the new governor of Zafarabad and the adjoining region of Awadh. However, very soon, Malik Sarwar rebelled against the Sultan and proclaimed his independence calling himself ‘Malik-us-Sharq’ (the ruler of the east). The dynasty founded by Malik Sarwar which ruled over Zafarabad (and later Jaunpur) was known as the Sharqi dynasty and their kingdom the Sharqi Sultanate of Jaunpur. The Sharqis ruled over Zafarabad and the region till 1479 when the Bahlul Lodhi defeated the last Sharqi ruler Hussain Shah and the kingdom was permanently annexed to the Delhi Sultanate by Sikander Lodhi. During the Sharqi dynasty reign, the capital was shifted from Zafarabad to the neighbouring new city of Jaunpur. 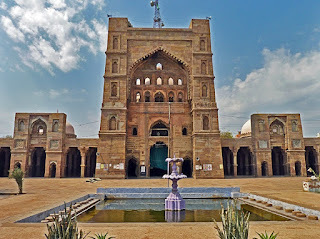 In 1359, Sultan Firoz Shah Tughlaq had founded the city of Jaunpur and had named it after his brother Muhammad bin Tughlaq whose given name was Jauna Khan. Under the Sharqis, Jaunpur gradually assumed all importance in the empire and once it became the capital, Zafarabad was eclipsed and relegated to being the second city of the Sharqi Empire. However, Zafarabad continued to remain in the glory of its Sufi traditions, music, architecture and also emerged as a major centre for paper manufacturing, for which it also was called ‘kagaz ka shahr’. The town remained in insignificance thereafter in history and during British India period it was made a part of the Bombay agency of Kathiawar state, forming a part of the territory of the Nawab of Janjira. After independence, Zafarabad was made part of the state of Uttar Pradesh and is today a small town and ‘nagar panchayat’ in the Jaunpur district of Varanasi division in the state. Photo credit and source: Pinterest, School of Architecture. I am participating in the #BlogchatterA2Z challenge and today’s letter is ‘Z’. Another fascinating read, Sayan. It was my absolute pleasure reading your posts about our country's culture and heritage. Congrats on a successful AtoZ. Congrats, Sayan, for completing the challenge, successfully. I enjoyed your series as it I learned so much from your posts.Thank you for sharing.